Today was spent at Disney’s California Adventure. 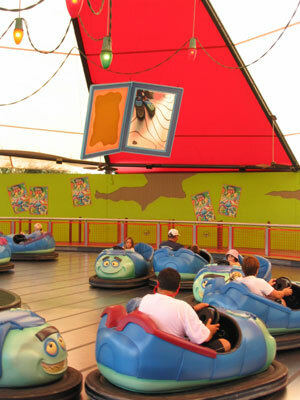 We’d visited California Adventure once before shortly after the park opened and my only lasting memory of that visit is of the Superstar Limo ride, the lameness of which was absolutely breathtaking. In it, you would ride in a garish cartoon limousine through a garish cartoon Hollywood as garish cartoon plywood cutouts of ABC TV stars leapt out at you. Mercifully, the Superstar Limo is no more. 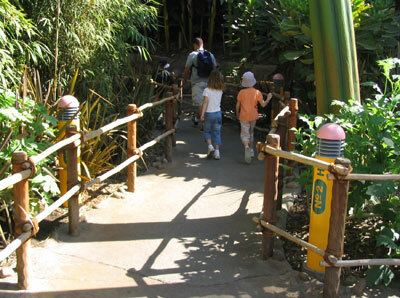 Another problem with the park back then was that it was very kid unfriendly. There was just nothing for young kids to do. Mercifully, that problem, too, has been remedied. 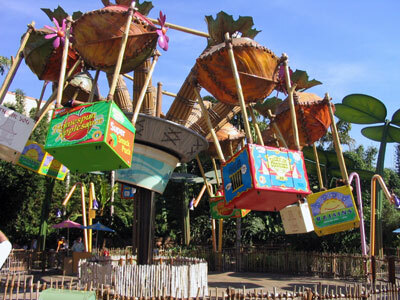 Not only have they added a terrific Playhouse Disney Live show, but they’ve opened a whole mini-park within the park called Flik’s Fun Fair. 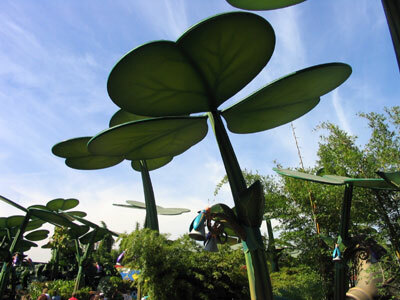 While the rest of Disney’s California Adventure is a “theme park” in only the loosest sense of the term, Flik’s Fun Fair (based on A Bug’s Life) is exactly what a theme park should be. It has a theme and it follows that theme down to the tiniest of details. For instance, Tuck and Roll’s Drive’Em Buggies are located under a discarded umbrella and decorated with Christmas lights and the contents of someone’s purse. Flik’s Flyers are made up of Chinese take-out, Snack Pack, animal cracker, and raisin boxes. Shade in the area is provided by towering clover. 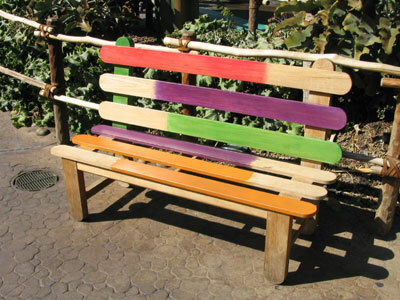 And The benches are made up of used popsicle sticks. Even the landscape lights fit into the theme. It’s brilliant…and another sign that the best stuff coming out of Disney right now is really coming out of Pixar.